I started this business in 1976 after graduating from Grand Valley State College with a Bachelor of Science Degree in Art and a Business Minor. My drive for creating sculpture is a simple one - Inspired by God's natural designs, my work reflects what I see around me and mirrors my own playful personality. I've been blessed greatly with a loving family which has always been the motivation for the discipline I have in my work. I suppose over the years, my sons have adopted the same work ethic and sense of accomplishment as their welding and sculpting skills have grown. The success of Anderson's Metal Sculpture is based largely on our desire to continuously improve our skills and change our designs. The evolution over the years has been a rewarding challenge. The plan for now, is to take a step back from copper and brass sculpting and do more with stainless steel and aluminum. Sculpting will always be a way of life for me. Troy Anderson - I am so grateful to have grown up doing art shows with my family. Traveling and being immersed in a variety of art has broadened my outlook on culture and contributed to my creativity. In 1995, I started doing shows on my own and used my income to pay for school. I graduated from Grand Valley State University with a BA in English and Elementary Education and have a Masters degree in Educational Technology. I have exercised that degree as a middle school teacher for over a decade. I also have the privilege of being the Head Coach for the middle school wrestling team. 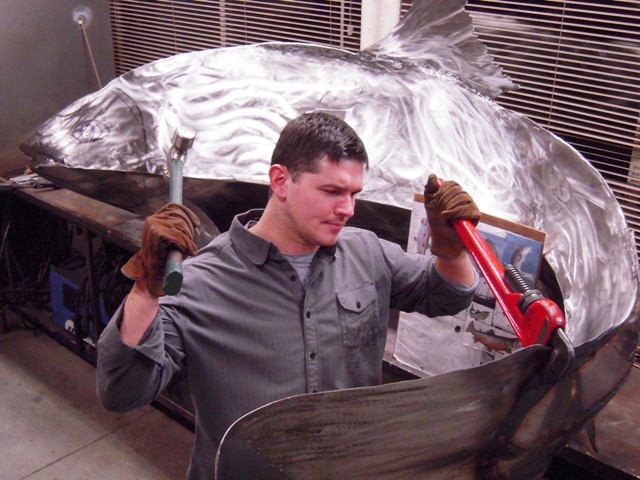 In the summer, I work as a full time metal sculptor with my dad, Steve and my youngest brother, Chad. Our family business continues to provide unique experiences as we travel, grow as artists, and meet new people. I am a second-generation metal sculptor. I've been brazing and sculpting copper and brass since I can remember, 15 years old to be exact! I love it so much I decided to make it my career. Being involved with art at such a young age has shaped my appreciation for other artists and their abilities. I travel all over the U.S. selling sculptures which is great because I get to meet new people and experience cultural diversities on the journeys. I am so blessed and fortunate to be doing what I love and I get to do this with my family! What I do is not a job; it is an adventure - and I love every second of it!